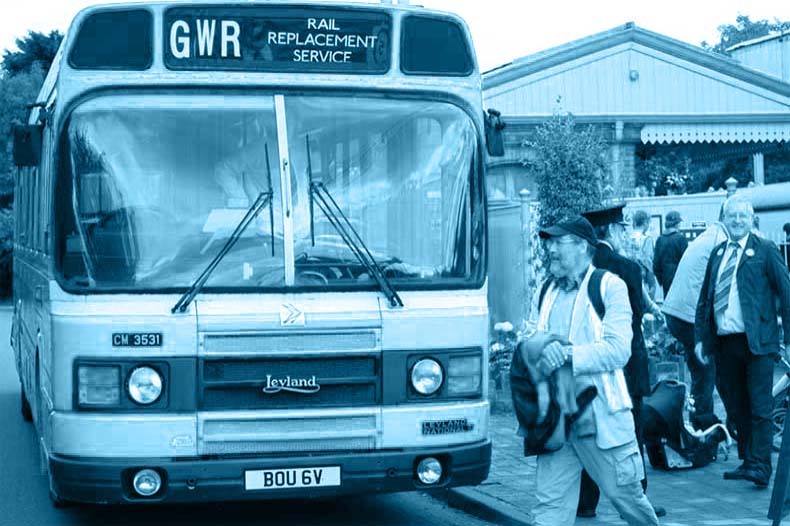 So… what do we know about bus replacement services? Especially good when the bus breaks down and is replaced by the bus replacement service replacement bus. Am I right in thinking this is our first three-word non-proper compound noun, and appears to be an utterly arbitrary selection from amongst many other three-word non-proper compound nouns beginning with ‘A’ or ‘B’ that have not featured in the lexicon? I’ll rescind my second ‘three-word’ there, to be a bit firmer on my pretentious rhetorical ground. Actually during the recent floods we were told there would be a bus replacement service but this was in fact replaced by a shuttle train. So would that be a bus replacement service train replacement service? I wonder if that bloke in the picture is the King Of Hi Vis? At Crewe Railway Station the Rail Replacement buses are located at a sinister place known as the Horse Landings. Just saying. Bus replacement service or train replacement service? The picture confuses me even more by showing a rail replacement service! I’ll overcome my doubts about the right of this entry to even be here (in relation to the rights of other neglected compound nouns that is), just to inform the viewers that at the moment signs all over the Sheffield trams are proclaiming that “due to rail replacement work throughout 2014, tram replacement bus services will be in operation..”. This all seems very reasonable. In Toronto, Canada, just took the bus that replaced the subway service from Downsview to Union Station. Only it only went as far as Lawrence West. You are left to your own devices in the windy boonies of north Trawno. British incompetence seems much cosier than its Canadian counterpart.